According to the U.S. Substance Abuse and Mental Health Services Administration (SAMHSA), first-time heroin use in the U.S. has increased 60 percent in the last ten years. The increase has been attributed to the inflating prices of opioid prescription painkillers, namely OxyContin, on the black market. Big Pharma mislead the medical community about the dangers of OxyContin by downplaying the risk of addiction when the drug was first introduced in the 1990s. OxyContin is a potent oxycodone-based painkiller that was synthetically created by the pharmaceutical company Purdue Pharma. Increased demand and decreased supply, due to government crackdowns, on the black market are causing the pills to be more difficult to afford, more people are turning to heroin. The spike in American heroin use has been most prevalent in the Northeast, especially in Suffolk County, New York, where heroin use has increased by 425 percent from 1996 to 2011. The Suffolk County Supreme Court also noted that the number of people admitted for substance abuse treatment for opioid painkillers increased 1,136 percent in the same period of time. SAMHSA found that prescription drug prices on the black market really began to rise between 2010 and 2011 for two reasons: increased opioid addiction increased demand and reluctance among doctors to prescribe painkillers decreased the supply, which caused prices to naturally increase. Crackdowns on prescription painkiller abuse have also dried up the black market supply and made it more difficult for doctors to prescribe the medicines, further contributing to decreased supply. To make up the loss, crooked doctors and others have developed “pill mills,” which are pain clinic offices that prescribe the pills in high amounts, even to people who are obviously substance abusers. 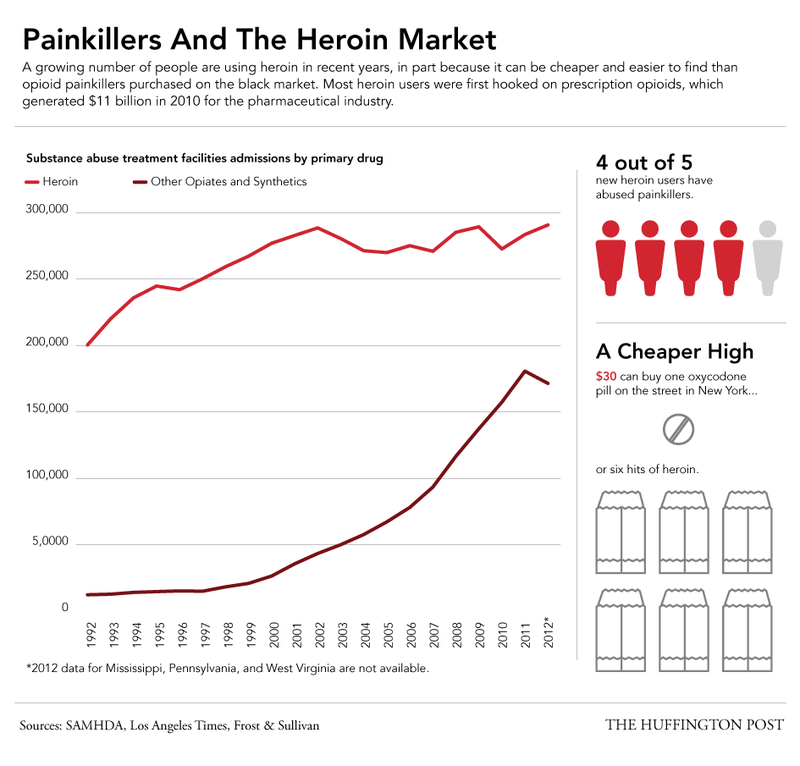 The price inflations have caused a major shift in opiate use. Last year, the Center for Behavioral Health Statistics and Quality found that four out of five new heroin users started using opiates via prescription painkillers. Whereas a dose of OxyContin costs between $30 and $100 on the street, a dose of heroin costs about nine dollars and is usually more potent than pills. One can purchase six doses of heroin for what one dose of oxycodone is worth. Big Pharma made a strong marketing push to doctors upon OxyContin’s introduction in the 1990s. Pharmaceutical representatives convinced doctors that there was a minimal risk associated with OxyContin because of the pill’s time-released formula, meaning the drug’s effects would continually last for long periods of time. The pharmaceutical company essentially downplayed the risk of addiction associated with OxyContin. “The medical community was taught to believe that believe addiction to opiates was relatively rare,” said Andrew Kolodny, the director of Physicians for Responsible Opioid Prescribing. In 2007, Purdue and three of its top executives pleaded guilty to misleading doctors, regulators, and patients about OxyContin’s addiction risks. The company was ordered to pay a $600 million fine. Last April, the U.S. Food and Drug Administration banned the original OxyContin and its generics. Heroin use in the country continues to soar.